MANILA, Philippines – Ferdinand Marcos’ declaration of Martial Law in September 1972 was, among many things, an attempt to silence the clamor against an oppressive government. But Filipinos still found ways to protest, and creatively at that. 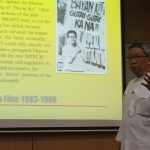 Author, playwright and film critic Nicanor Tiongson, in his lecture entitled, “Hindi Ka Nag-iisa: Voices of Protest in Literature, Theater and Film (1983-1986)” on Thursday, August 29, noted the changes in protest in the arts, after the declaration of Martial Law. Tiongson said both literature and theater at that time were circumventing, creating all kinds of symbols to let out the truth. For instance, Dominador Mirasol’s novel Ginto ang Kayumangging Lupa fused creatively in its structure the main slogan of activists: Marcos, Hitler, Diktador, Tuta. In theater, plays were either historical or traditional, but with stories that reflected the struggles of the present time. “[The New Cinema was] created by auteur directors who have artistic vision and artistic integrity. They brought about films that dared to expose social and even political realities,” he said. These films include Maynila sa mga Kuko ng Liwanag (Brocka), Minsa’y Isang Gamu-Gamo (Lupita Aquino-Concio), City after Dark (Bernal), Kisapmata and Batch ’81 (Mike de Leon). For 11 years, Tiongson said two ideologies influenced the arts, in literature mainly. These ideologies included national democracy and the pre-Martial Law democracy. But the artistic protests took an interesting turn when Benigno Aquino Jr was assassinated on Aug 21, 1983. Overwhelmed by the assassination, Tiongson said the two movements united in a “temporary, fleeting alliance” seen particularly with their similarities in literary themes. Artists of both literature and film were no longer repressed by the atmosphere of censorship. Theater plays tackled national and sectoral issues in broad daylight and in all kinds of venues: open air, closed theaters, and streets. Poems about the assassination and the snap election were published in magazines. An attempt at stricter censorship in films only pushed filmmakers to protest beyond the big screen. In February 1983, Lino Brocka and other artists protested against “arbitrary, senseless censorship” and organized the “Free the Artist” demonstration at Plaza Lawton. This protest led to the creation of the Concerned Artists of the Philippines. All these protests in the arts, Tiongson said, brought into the general public a consciousness of the regime’s corruption, cronyism, and fascist tendencies. 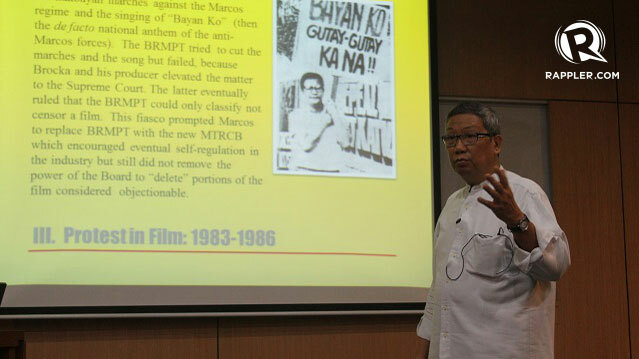 Tiongson ended his lecture with a clip from the ending of Sister Stella L, one of the open protest films directed by Mike de Leon and written by Jose Lacaba.